Glycosidases namely myrosinase and β-amylase, have been isolated fromBrassicaceae. These enzymes were identified and estimated by the rate of glucose and maltose formation from sinigrin (thioglucosinolate) and amylose (polysaccharides) hydrolysis, respectively. Their activities (U/g dry tissues) varied with the different species of the plant and with the different parts of their tissues. Generally, they were higher in the germinated seeds (3.3-8.0 times) than in powdered or defatted powdered dry seeds. The best amylase and myrosinase extracting solution for radish and white mustard germinated seeds was distilled water, and for turnip germinated seeds, it was 0.1M phosphate buffer, pH 6.0. In the light, the optimum germination temperature for amylase production or activation by radish and white mustard seeds was 25°C, and for turnip seeds, it was 30°C, whereas for myrosinase production or activation by radish and turnip, 25–27°C was the optimum temperature. 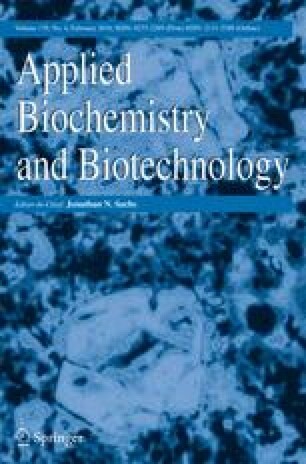 The highest myrosinase activities in black mustard and radish defatted dry seeds were obtained by extraction with 1% NaCl at 272/30°C and distilled water at 25–27°C, after an incubation period of 4–6 h. Comparative studies indicated that fresh radish roots were the most potent amylase and myrosinase producers compared with radish leaves or roots, stems, and leaves of turnip and cabbage. Amylase and myrosinase were partially purified from water extracts of fresh radish roots by optimum precipitation with ammonium sulfate (100%). Some physicochemical properties were studied.